Democratic vice presidential candidate Tim Kaine has already inspired countless memes regarding how much he reminds everyone of their dads. America's Stepdad did it again this Tuesday, when he was so excited to vote (or so busy on Election Day) that he tried to be the very first person at his polling place. Despite his 5:45 a.m. arrival time, though, Kaine came in second to 99-year-old Minerva Turpin, who was born before women could vote. Kaine, who was at the polls with his wife, Anne Holton, seemed happy to follow Turpin and posted a picture of the encounter on Twitter, where it quickly went viral. Turpin, who serves as president for the retirement community where voting took place, did not reveal her vote, but she was reportedly friendly to Kaine, welcoming him and putting his "I Voted" sticker on for him, and Kaine suggested to reporters that he thought she might support his and Clinton's ticket. Turpin is one of many women born before women's suffrage who will be participating in this election, and if Kaine is correct, one of many such women who are enthusiastic Clinton supporters: 102-year-old Jerry Emmett was featured on Inside Edition and 103-year-old Ruline Steininger was featured on CNN earlier this fall. Both women cast their ballots for Hillary Clinton. And longer even than the lines at the polls are the lines to see suffragette Susan B. Anthony's grave site today, where female voters are leaving "I Voted" stickers in honor of Anthony's struggle to earn the vote for women. 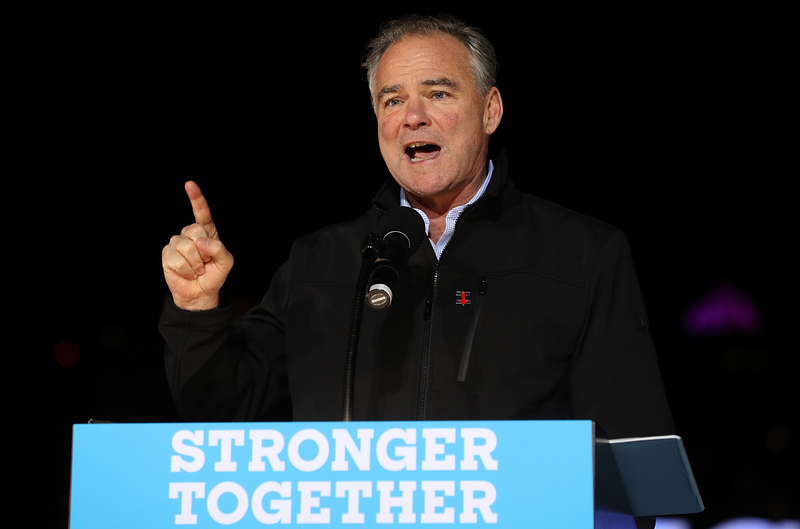 Kaine captioned the tweet, "looks like I need to get used to being number two!" a reminder of his famous niceness. According to his ex-roommate, he is one of the nicest people, in politics or anywhere. There's even a book for sale on Amazon all about how nice Tim Kaine is, Tim Kaine is Your Nice Dad , in case you're looking for what might be the strangest piece of election memorabilia this cycle. His plans for the rest of the day included a post-ballot breakfast at the diner in Richmond where he apparently eats with his friends every Tuesday morning. It's a surprisingly pleasant coda to what has often been a relentlessly bitter election season: the very moving image of women's history come full circle, and a smart, qualified man standing in support of that movement and beaming.